3eem start in 2003 trying to research the point of equilibrium and interaction between traditional instrumentation (electric guitar and tenor saxophone) and techniques of digital processing of audio signals. The textures of 3eem arise from soundscapes created in studio intersected with live sax and guitar, drawing well defined sounds. Stylistically 3eem don’t follow genders or stereotypes of some type. Born 18/10/1970 in Ivrea , graduate in computer science, he works as a software developer from many years in a UK based SW Company. From 1988 to 1993 he is voice and sax of Nasty Nurses, a band devoted to a sick crossover influenced, in the same way, by Faith No More and Naked City; they recorded a self-titled demo, but in 1994, due to some problems, they continue under the name BazzCoast. 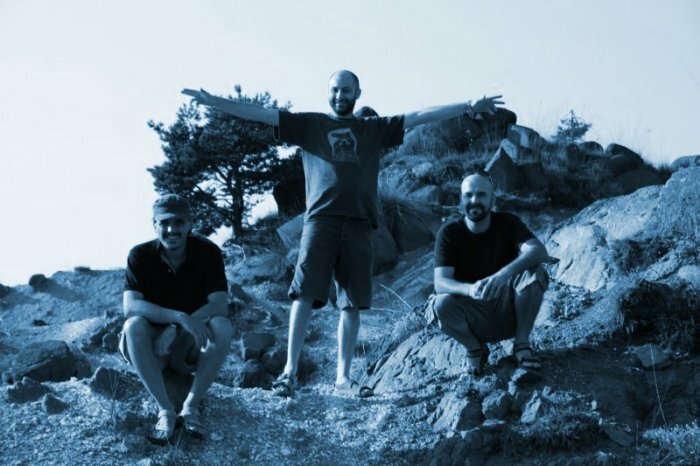 From 1995 he is main member of dBuzz, a band addicted to a sort of progressive noise, where he works with voice, sax and guitar; they recorded two demos and a Cd-R. From the beginning of 2003 he actively collaborates to 3eem. Born 22/07/1973 in Ivrea he works in a Public Health and Environment Authority as a acoustic technician and he's graduate in electrotechnics. Born 05/01/1970 in Ivrea , graduate in computer science, he now works as a mechanical designer in a Italian research institute for Laser technology. Active from 1988, he grows among the cross-over delirium of Nasty Nurses, where he plays keyboard. Following a parallel path and approaching to electronics, he lives the Ludwig Élite experience, an industrial/twilight project. Subsequently he creates Neural Coital (Cited in the “Manual of industrial culture” Research-Italian edition) and the experience Ludwig Élite assumes cyber-technological tones of the end of the millennium. In 1994, also continuing to sharpen experiences regarding the use of machines and computer, he becomes part of the Disoriente, a space-psychedelic band in which the ‘70 sound is melted with the technology of the sampling and electronics. Since 1996 he is totally involved with electronic music; Abstract Quadrant is born: a two men band exploring jungle-ambient. They issue two demos and a soundtrack for a short film entitled ‘In Giro Click’ introduced at the Cinema Giovani Film Festival of Turin (1998 edition). At the end of 1998 he remains the only member of Abstract Quadrant and the name becomes Abstract Q, developing experimental electronic sound and issuing three records: “Selected Frequencies For unrepressed Neural events” (Saalplaat\Open Circuit - OC 020) 2000 “Stains And Scribbles” (Bake Records\Staalplaat 050) 2001 “Sonar” (Self-produced) 2003 At the beginning of 2003 he starts 3eem. From 2005 he is also involved in the electronic duo ULNA.